At AAASUPERLUBES we are always looking for ways to help you save while using great quality products. That is why today we want to talk about how a synthetic oil changes can offer better overall protection and improved security against the troubling effects of sludge buildup. Synthetic oil has such a superior chemical composition that allows it to offer great benefits. The molecular structure of synthetic oil is specifically created to make it resilient and durable, even when during difficult conditions and against harsh factors. The stable makeup of synthetic oil enables it to withstand intense temperatures without suffering any sort of deterioration. It also flows constantly even in the cold without thickening, and does not need to be warmed up before it starts to distribute lucubration security. When confronted with sludge synthetic oil effectively assists in eliminating it, helping it stay clean and conserving its protective properties much longer and more efficiently. The is also means that when you get a synthetic oil change you can go much longer between oil change intervals and not have to worry about your engine being unprotected, because with synthetic oil, your engine is truly in good hands. Contact us now on (425) 327-9389 and find out more on how you can start increasing your savings and improving your engine. Although synthetic oil does play an important role in helping your engine stay soot free, there is another important piece that allows the sludge build up to be removed and disposed of. The oil filter is not a big item but it does have a large role. As synthetic oil picks up the different sludge deposits that it finds along the inside of the engine, it carries them to the oil filter, where the soot and other undesirable residues are drained from the oil. Normally there might be tiny particles of dirt or dust that may remain inside the oil. With conventional oil, those tiny left over particles can quickly begin to deteriorate the lubrication abilities and make the oil less efficient. Synthetic oil has the capacity to dissolve any minor particles of residue left inside it and can work just as well even in these circumstances, although over time it does need to be changed, the length of the intervals between a synthetic oil changes is much greater than those of regular motor oil. Also, the fact that synthetic oil has important dirt eliminating additives, does not mean that it does not rely on the oil filter as well. The oil filter is an essential component in continuously removing the larger sludge deposits that may build up or that already exist in an engine. Sludge deposits specially accumulate in engines that have not used synthetic oil before. These sludge deposits can begin to grow and stick to critical engine parts, hindering their performance and eventually impairing them and causing your engine to break down. Keeping this in mind, it is important to mention that when you use synthetic oil for the first few times it is necessary to check the oil filter often and replace it as needed. Why Do You Need to Check the Oil Filter More Often When You Get Your First Few Synthetic Oil Changes? When an engine has used conventional oil it has a greater amount of sludge and residue build up and synthetic oil will start assisting in the elimination of such, therefore for the first few times you will find larger amounts of sludge stuck to the oil filter. If the oil filter becomes overstocked with large quantities of sludge that is being eliminated, then it will clog and not allow the oil to efficiently pass through, limiting the lubrication of your engine, and leading to severe damages. 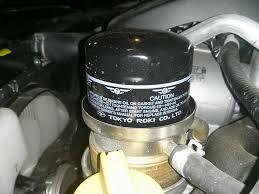 Keep an eye on your oil filter and buy the right replacement. For your convenience you can purchase oil filters, quality full synthetic oil and other essential products for your engine in our online store here. There are many important aspects of motor oil that allow it to be efficient in protecting your engine. No other motor oil does the job better than Amsoil full synthetic oil. From the street to the road and regardless of the obstacles, Amsoil offers greater protection and enhanced performance. Purchase Amsoil now, and go get your synthetic oil change today. Call us at (425) 327-9389 ask about our specials and how you can start investing on the right products for your vehicle.